I hope you will forgive a slight indulgence here. This photograph has members of the North Staffordshire Railway Study Group baffled as far as its location is concerned. It's not an NSR station and is strongly believed to be on the LNWR - but where? The advertisement mentions trains to Rhyl, so perhaps the North Wales coast - but neither Abergele nor Rhyl as these had four tracks between the platforms I believe. The thought occurs to me that this is Colwyn Bay which had two tracks between platforms and also has the necessary curved platforms, and from the curvature this would be an Up service? Much speculation here. The engine is Converted 'A' Class, 2-4-2T no. 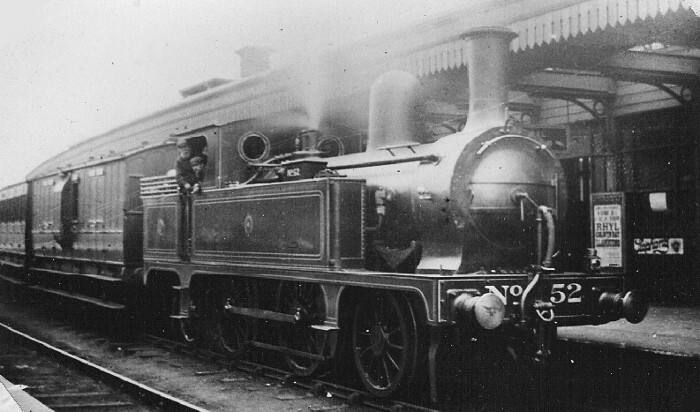 52, built in 1879 as a 2-4-0T, converted to a 2-4-2T in 1899, inherited by the LMS in 1923, becoming no. 1454 and finally being withdrawn in August 1932. This photo is said to be Loco & General Railway Photos No 5800 - it's in the NSR book by Manifold (Henstock 1952) - but nothing is said about the location. If anybody has an old L&GRP list it may tell us something, but I'm not very hopeful. I don't think it can be Ashbourne because of the pattern of the roof-support brackets and the valance, and although the brackets are like those at Colwyn Bay, the valance looks different and the curve seems a bit too sharp. I have W.T.Stubbs own copy of this photo. On the back he has written Ashbourne Joint Station, and also WHW copy. The canopies and their supports (and the buildings, as much as can be seen of them) look very like those on the Chester and Holyhead after quadrupling. The winter working timetables of 1908 and 1910 show no NSR engines working beyond Mold Junction (and to and from Mold Junction only on one goods train each way). But I expect that some did so in the Summer, specially on "Saturdays only" trains. So I think the location must be west of Flint - if not Colwyn Bay, what about Llandudno Junction? Would the NSR have sent a locomotive of this type as far afield as North Wales? I've studied this before. My guess is Llandudno Junction Platform 3 (down fast) due to curvature. Train is probably a summer Sat special to Llandudno. The station buildings are in the right place (Holyhead end) and are of the right type. The "WHW" on the back of Bill Stubbs' print was probably Will H Whitworth of Manchester, who collected old photos from all over, and - thankfully! - made copies. Both he and Bill would have known Ashbourne station, but I'm sure that whoever identified this photo as being there was wrong. Sadly, we can't ask either of them: Whitworth died in 1957, Bill in 2002. The station didn't change much in its 60-odd years, and even if the visible brackets and valance had been changed, then changed back again, that doesn't look like Ashbourne's wooden platform. Another thought, would the cost conscious LNWR have advertised trips to N.Wales on stations in North Wales? There must have been lots of places on the NSR where there were platforms or sidings on curves (on the Loop Line, for instance), as there were on the LNWR. There was a similar wooden strip at Stafford and I thought it might be in the platform 'round the back' as we used to say (so much for the 'Finest etc etc ... ') but the roof supports are quite different. If Manifold could not identify the location, perhaps we can excuse ourselves if we can't. I have a print of Ashbourne, and a train in the same sort of situation as the mystery photo, to show that the latter is not at Ashbourne. It is the first picture ever taken by Dr Jack Hollick. The date is about 1919 and shows that the station canopy is not the same as the one in the mystery photo and that the track in the foreground is in much better condition. Another point is that all local passenger and goods trains were worked bunker or tender-first from Uttoxeter; only the later through working to and from Buxton were engine-first. The NSR only had substantial curved platforms at Uttoxeter, Ashbourne, Hanley and Kidsgrove (Crewe line) as far as I can recall. Mike Bentley has (I think correctly) ruled out Ashbourne and the platform canopy in the mystery photo is significantly different from the ones to be found at Hanley or Uttoxeter. I think that Kidsgrove can be ruled out too because the canopy in the mystery photo is too long for it to there. What about Bangor (the island platform) - though what an NSR loco is doing there is anyone's guess. Has anyone considered Stockport and is the headlamp code significant? If you look at the Railway Poster at the right hand side of the locomotive. It is a railway poster, advertising Rhyl, Colwyn Bay & Llandudno? Therefore it is unlikely to be any of these three Stations! So, could it be Llandudno Junction? Could it be a Down Excusion to Llandudno? The curvature for the Down Main Platform is correct! I'm certain that this is Walsall station, with the engine headed north, back to the NSR. The station roof details all fit, and the curve is where the platform narrows at the south end. The date is 1903 at the latest, before the Clearing House headcodes were introduced; until then, a single lamp over the right-hand buffer indicated an ordinary passenger train. I've checked the Ordnance 25-inch plans surveyed in 1884 and 1912 and am quite certain that this photo was taken at Walsall. The photographer may have been Thomas Hinckley, a platelayer on the LNWR who took railway photographs at Walsall at this period (1902- ). This is suggested by Roger Carpenter's fine L&NWR West Midlands Album (Wild Swan, 1988) which contains several by Mr Hinckley including one (p39) of a train at the same platform, but a little further north and headed by 863 Meteor. As well as the 25-inch plans, the Ordnance Survey produced a 1:500 plan of Walsall (41.66 feet to an inch) surveyed in 1884, which shows the position of lamps, water columns, cranes in the goods yards etc. Together with the photos, almost enough to build a model! I'm somewhat hesitant to go against Harry's conclusions but browsing through George Dow's Great Central Album - confession is good for the soul(!) - recently, and looking at photos of the MSJA platforms at Manchester (London Road), on pages 32 and 33, it occurred to me that this could be the location for this photograph. Developing the idea, I think that the photo is taken from the MSJA platform which was 'attached', as it were, to the main station, and is of a (recently arrived?) Down service. It is also much more likely for an NSR engine and stock to be at London Road of course than to be at Walsall. The little bit of platform edging (bottom lh corner) is explained as is the 'outside' curve. Posters for North Wales would have been found at London Road and the station canopy is also correct. David Moore definitely has a point here. His logic is sound. Unfortunately these plaforms were demolished at the end of the 1950s, as part of the Electrification Project, when I was a mere youth! Looking in Scenes from the Past No 36, Altrincham to Manchester by N.R. Knight, [pub 1999], the photos on pages 78 to 81, show the roof details and curvature, to be entirely correct for the Down Through Platform at Manchester London Road. David really has pointed us in a new direction! That it is London Rd. is an interesting idea, but was it likely that an NSR train would be found on one of the through platforms? This photograph seems unlikely to have been taken at Manchester London Road. The edge of the MSJ&A Down platform (no. 2 - the only one it could be) had a continuous curve, whereas that in the mystery photo is straight and curves only towards the far end. The roof covering visible in the photo is longer than the uninterrupted length of that on the MSJ&A platform; from this camera position a footbridge and (probably) a crossover would have got into the shot. The steeply glazed roof would have been apparent from the opposite platform, with a different pattern of supporting girders. The chimney in the photo looks too substantial to have come from the small huts at the end of the MSJ&A platform. At Walsall, however, everything fits - the straight then curving platform, the length and details of the roof, the chimney - and there is no problem at all about the presence of a North Staffordshire engine there. The NSR ran passenger trains to Walsall, but I don't think they had equivalent running powers over the MSJ&A. Regarding Harry Jack's comments, I would dearly love for it to be Walsall (being the home team!) and after looking at my copy of West Midlands Album I should say I'm about 90% in agreement, although I do have some reservations. The photograph seems to show the train standing at platform 3 facing north. The camera appears to be set up on platform 4. This all seems to tie in with the theory that is a Thomas Hinckley photo taken from a slightly different position to the Meteor picture in WMA. My reservations stem form the fact that it is an NSR locomotive with NSR stock at Walsall. Although the NSR had running rights into Walsall they didn't run a regular service along the old SSR line. As far as I know the NSR occasionally ran a North Western service using North Western carriage stock pulled by a North Staffs locomotive. This would seem to suggest the photograph is located deeper in NSR territory. Definitely not on the NSR itself Brian. I think the consensus is that this is Walsall.